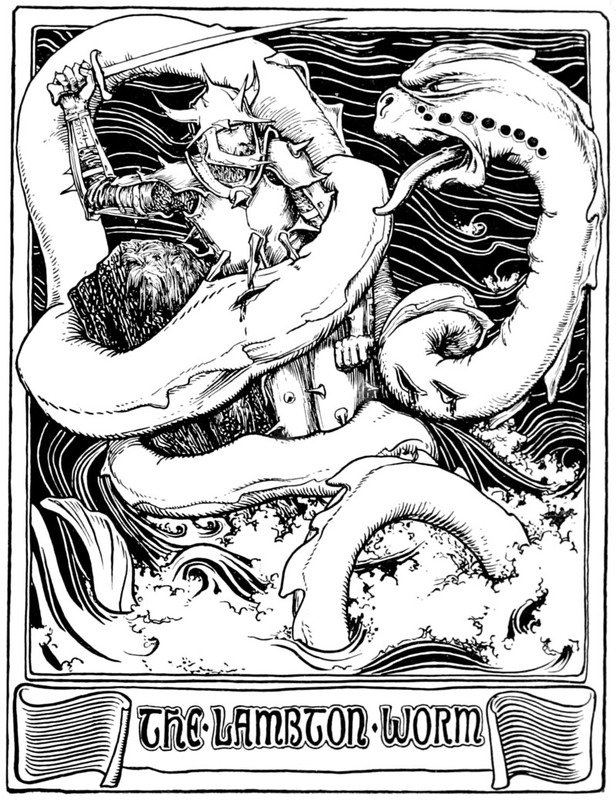 The Lambton Worm is a story of tragedy, heroism and a large wormy dragon from my neck-of-the-woods in the North East of England. It tells of knights with shiny armour, a knight with a sharp suit of armour, a dog and a big roughie toughie dragon with a taste for anything on legs. The story starts in a place not too far from Sunderland, near to Newcastle too, but not as near as it is to Sunderland. Now I know my friends in Sunderland will hate me for this – as strictly speaking they hate (and I mean HATE) being called Geordies (people from Newcastle) – but in order to be understood by those of North-eastern descent I’ve put my original text through a Geordie translator. Hammer and Tack in the chuffin’ day of the bloomin’ crusades, john lambton the young ‘eir ter lambton ‘all took ‘is sunday Frank Bough ter Scapa Fla fishin’ chicken pen ‘e should ‘ave been garn ter Left in the Lurch. while fishin’ ‘e caught a powerful black and nasty lil’ eel loike animal wif big Hampstead Heaf and covered in slime. not ‘appy wif ‘is catch ‘e ignored Robin Hood advice ter thra it away and ‘e threw it daahhhn a ‘eaven and ‘ell. No that’s not good, the Geordie Translator seems have thrown in a bit of Cockney rhyming slang too. Anyway here’s the story in the Queen’s English… alreet. Back in the day of the crusades, John Lambton the young heir to Lambton Hall took his Sunday off to go fishing when he should have been going to church. While fishing he caught a powerful black and nasty little eel like animal with big teeth all covered in slime. Not happy with his catch he ignored good advice to throw it away and he threw it down a well. While John was away crusading and doing things that knights do – when they have time off – the worm grew and grew and grew until one day it got big enough to slither out of the well. It slithered out and leaving a trail of black slime it swam into the river and wrapped itself three times around an island in the middle of the river, it was that big. The local villagers weren’t happy and tried to get rid of it. Unfortunately it wasn’t for shooing and it decided to eat lots of cows and sheep and the occasional villager who tried to get in its way. Anyway a good dragon always attracts good knights and knights turned up in their splendour and shiny armour to sort out the nasty dragon. The dragon though was too powerful and the knights didn’t last long and ended up being chomped down as the dragon’s dinner, just like the villagers. This dragon was particularly nasty and as the more skilful knights found out, if they got to chop off a bit of it, then it would join itself back to the dragon and heal up. The knights, even the good ones, never stood a chance. Seven years passed and John returned from his crusading. He was big, strong and wiser now, so when he heard of the dragon he decided to take it on, but not after consulting with the local witch who knew how to handle tricky dragons and their like. As John was as sharp as his new armour, John arranged to have his Dad set loose a hunting dog (he mustn’t have liked that dog) on the signal he would give after killing the dragon. He would then kill this poor dog and that would be that… no curse…. No comfort of course to the poor dog – who was called Pongo by the way. Anyway he hunted down the dragon and led it to the river for a big fight. The dragon coiled itself around John and as it squeezed down on him it was diced up into little chunks by the big sharp blades all over his armour. Normally these chunks would have reattached but cleverly they washed away in the current of the river, so John all proud of his dragon slaying gave the signal to release the dog and sadly (well not for the dog) his Dad was so happy he ran over instead of the Pongo. Now John loved his Dad, so he didn’t kill him and in my version of the story Pongo trotted off home and had a nice bowl of ye ancient Winnalot. Anyway the curse now stood and nine generations of Lambton were cursed not to die in their beds. Still the villagers were happy, they didn’t have a great big dragon eating them and their livestock. So most of the people lived happily ever after. Y’know what there’s also a traditional song in the local North Eastern dialect, see if you can understand it. He thowt leuk’t varry queer. An’ fight i’ foreign wars. The queer worm i’ the well. An’ greet big goggle eyes. Ov brave and’ bowld Sor John. An’ sheep an’ lambs and caalves. An’ leeved i’ mortal feor. O’ the famis Lambton Worm. Wi’ the aaful Lambton Worm.